IT'S EARLY. In fact, it's even darker outside your home now than it was last night when you went to bed. Somehow you sleepily stumble into your finest new clothes, wake the kids, get them dresses, walk out into the chill morning air. It's a short trip to a local hillside, and you arrive at five. It's an Easter Sunrise Service. All your friends and neighbors are there. You squint to make sure you recognize all your neighbors — and hope they'll recognize you. The services are about to begin. The minister preaches soft intonations about the Son of God risen. The audience is led to a quietly emotional climax, and then the long-awaited moment arrives — the first sharp ray of the yellow orb peeks over the eastern horizon. Every head bows in worship. Later on in the morning, there is a romping family egg hunt at home. Colored eggs, chocolate eggs, candy eggs. The kids love it. Look at the glow in your daughter's eyes as she looks for eggs, collects them, counts them, eats them. Next comes a more formal 11 a.m. church service for which the entire family dons Easter haberdashery. After a pleasantly brief sermon, there is the traditional Easter dinner at grandmother's, followed by relaxation and a little sleep after so long a day. 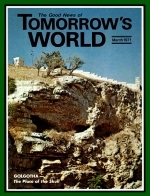 That is Easter — your town — your home — 1971 A.D. — RIGHT? This is Ishtar — Babylonia — 1971 B.C. Every one of the customs described above dates back over 4,000 years to Babylonian Ishtar worship. When Babylon fell, the migrating Teutonic tribes continued the same observances to their spring goddess, Eastre (or Ostara). These pagan Germanic observances were then incorporated into nominal "Christianity" during the Dark Ages in an effort to win the European pagans to the fold. Thinly veiled paganism has survived virtually intact for 4000 years. As languages have evolved, developed, and formalized, the word EASTER has been pronounced identically the same, and the customs remain unchanged. But so what? Isn't Easter fun? Don't the kids love it? No! Children don't love Easter, the holiday. They love pink dresses, chocolate eggs, eating lots of good things, a week's vacation from school, dressing up, and eating sweets. Make no mistake. Kids don't love Easter. They love things! How about you adults? Do you love Easter, the day, or do you only like buying new clothes, meeting old friends, eating a big meal, relaxing, and seeing perhaps your only sunrise of the year? Doing some of these things is not wrong of itself, but be honest with yourself. Couldn't you do those things on February 27, June 4, or even the first Tuesday of every month? Why do it on a day you never could quite calculate — "the first Sunday after the first new moon following the vernal equinox"? Who told you to do it on that day? The Government? Your employer? The Bible? What is it about Easter that you cling to? Can't you enjoy the good life any day? If you observe it for religious reasons, surely you can find the day commanded in the Bible, observed by the apostles, or at least predicted by the prophets. You can't?